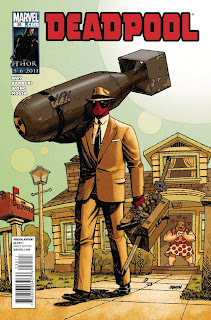 Deadpool #33-36 (including #33.1)Let's review Deadpool's adventure in space, and return to earth where he faces a bad-guy from aforementioned space whom we readers thought dead from issue #32. Oh, and there is a random .1 issue that has nothing to do with the other story, which as has been discussed on this blog multiple times really defeats the purpose of .1 issues, but bitching and moaning about that really gets us nowhere. As it stands apart from the rest of the comics, let's discuss issue #33.1 first. 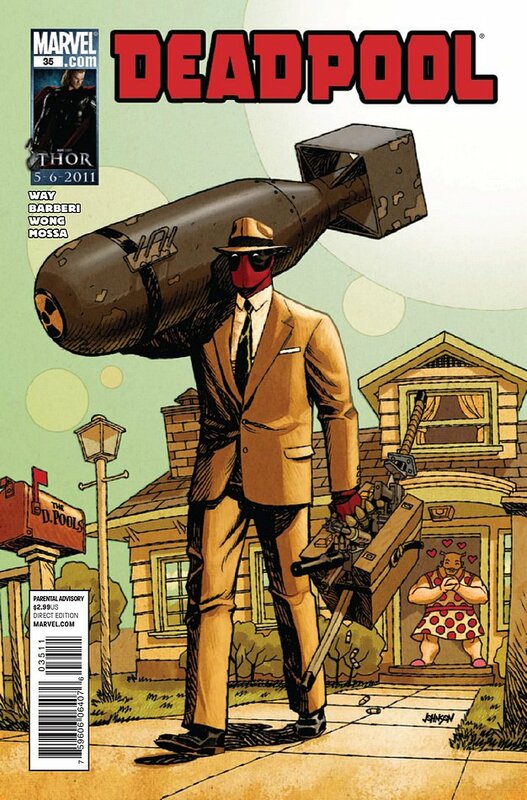 Like all the issues, it is written by Daniel Way, who of all the Deadpool books that have been on the stands seems to be the best person writing a Deadpool-related book. This .1 issue has art by Bong Dazo, whom people may recall as the artist for the "Deadpool: Merc With a Mouth" 12-issue series that was released as one big book I also reviewed. 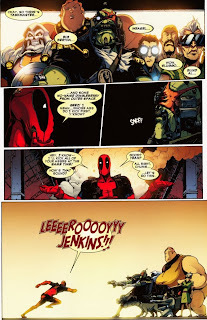 It's a fine little story with a neat twist, showing off how Deadpool can be a good guy, but it weirdly has Wrecker as someone who is doing good also--which is just really out of place for the character. Dazo turns in some nice art though--and this is otherwise a decent done-in-one tale that doesn't tie in to the main story set in space in any way whatsoever. #33-35 is a fun tale of Deadpool in space trying to take down "Id, The Living Moon," a relative of "Ego, The Living Planet," with the usual clever, "Deadpool out-thinks everyone," plot that Daniel Way has been going with lately. There are plenty of fun jokes and some serious moments where Deadpool points out how alone he feels in the world--something which comes into play further in issue #36 (more on that in a moment). It's pretty good stuff even if not too amazing, but issue #36 was where I had a real hoot. 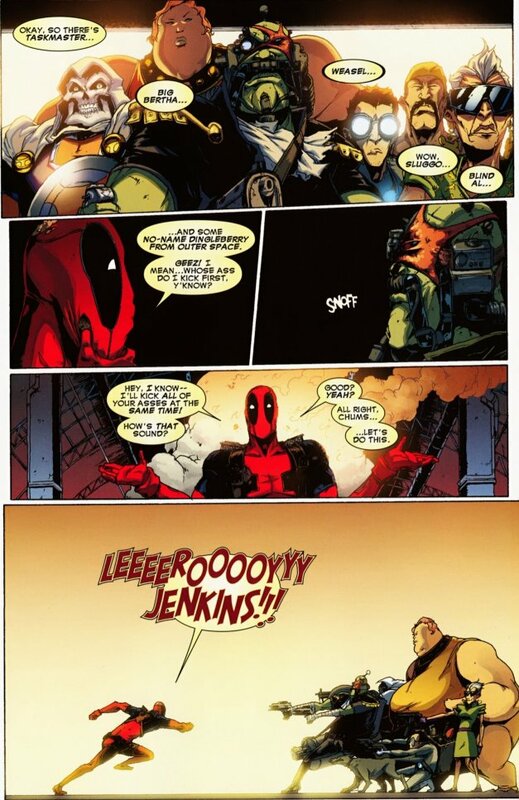 In issue #36, Macho Gomez, whom Deadpool thought defeated at the end of issue #32, has assembled a bunch of Deadpool's friends who hate him and are essentially enemies and they duke it out in an issue beautifully illustrated by Sheldon Vella. It is darkly humorous and has a very serious bit of soul-searching on the part of Deadpool about what he really wants in life and how he doesn't have a friend in the world. It's both a hilarious and sad issue, probably the high-point of all the ones I read--I really enjoyed it. World of Warcraft reference, nice. 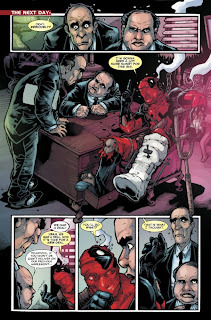 Deadpool has been a solid series in the hands of Daniel Way. Various Deadpool-related series have come and gone in the meantime but this one has thankfully stayed and continued to entertain. There are probably still too many Deadpool books on the shelves, with various one-shots still coming out now and then, but this series is a quality piece of work. If you only read one Deadpool title it should probably be this--not counting titles that involve him but aren't Deadpool-centric like the great Uncanny X-Force, of course. Anyways, pick up Deadpool and get ready to laugh and maybe think a bit too.